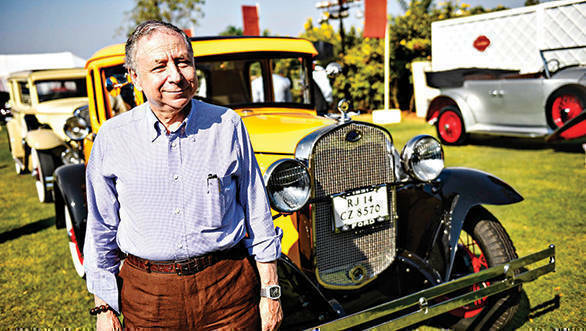 Jean Todt (president of the FIA) was a judge at the 2017 Cartier Concours d'Elegance in Hyderabad. He chats with us about road safety in India, classic cars, the Liberty Media takeover of F1 and the future of the sport under its new owners. I must say that I was happily pleased to see drivers use the seat belt; however, unfortunately I don't see the passengers wear a seat belt, which includes the ones seated at the back. Also, motorcyclists as well as pillion riders do not wear a helmet. So still, there is a lot to be done. It is very painful to hear that in India, about 2,00,000 people die in road accidents every year and millions of people are injured. We know how to avoid it. We have to improve education, law enforcement and make road infrastructure safer. Vehicles also have to become safer and there has to be better post-crash care. I was pleased to hear the government's ambitions about improving the situation as well as the inputs from the minister of road and transport [Nitin Gadkari]. There are simple steps to be taken. For example, enforcement of the law regarding wearing seat belts and helmets or speeding or drunken driving. The result would be a decrease in number of victims by half. This is why I feel TV stations should also participate in educating people about what to do. Unfortunately, we did not see the numbers decreasing. It's what we need to see. In some developed countries, over the last 40 years, I've seen the numbers decrease by five [times] while the number of vehicles multiplying by three. So we know how to do it but it's time now to do it. It is very beautiful because Indians have the passion and culture for beautiful monuments and buildings and cars. Seeing how the Indian owners give attention and care to make their cars corresponding to when they were just produced. I really enjoyed refreshing my memory as well as the opportunity to have access to this Indian culture. Yes, I'm fortunate that I have a few of them. I don't have a lot of time to drive, but when I have some free time I can at least think of them. It's an ending of one chapter and the opening of another one. Over the last half of the century, Bernie Ecclestone has been the commercial rights holder, working with the FIA as a regulator and legislator. Now the new group has both the commercial rights with a new manager Carrey and a new team. I think it would be a constructive change. We must thank Bernie and congratulate him for what he has done. Wishing him all the best because I'm sure he can do some many other good things. And we must welcome the new owner and the new leader of the organisation. Will spending increase in F1? We should not speculate about some declarations. At the moment, in 2017, there are 20 races and I hope we'll have a great championship with the new technical regulations. We should give some time to the new commercial rights holders to work carefully with the FIA to see what should be the next constructive change, not taking into consideration all the speculations that are running around. I welcome him and I'm sure he has a very good understanding about motorsport and Formula 1. He will be of great value and I'm happy that my people will be able to collaborate with him and the team. we should also wish him all the best and I hope he will be able to give something back to the sport which has given him so much. Seventy years of Ferrari: Scarlet fever!